The consumer market for energy-aware solutions is poised for dramatic growth. Deployment of smart meters will usher in a new era of home systems and applications to help consumers manage their energy consumption. Home Area Network deployment will require a mix of wired and wireless technologies in order to create a transparent solution for consumers. Power line communications (PLC) is expected to play a significant role in homes since every home is already wired. Past challenges of using power outlets to connect devices in the home included a lack of industry specifications, multiple sources of electric noise, and difficulty passing through phases in the home. HomePlug technology has overcome these challenges by creating specifications with advanced, optimized algorithms that are realized in semiconductor technology. HomePlug addresses the lack of standards, multiple sources of noise and connection through different electrical phases. Many devices have HomePlug built in and to connect them to a network all one has to do is to plug the device into the wall in a home with other HomePlug devices. Since surge protectors and similar devices may interfere with the high-frequency signals used by HomePlug, the directions included with HomePlug devices recommend plugging them directly into the wall outlets without using extension cords or outlet strips. FEC – Forward Error Correction - A system of error control for data transmission, whereby the sender adds redundant data to its messages, also known as an error-correction code. Power lines are noisy. This allows the receiver to detect and correct errors (within some bound) without the need to ask the sender for additional data. The advantage of forward error correction is that a back-channel is not required, or that retransmission of data can often be avoided, at the cost of higher bandwidth requirements on average. FEC is therefore applied in situations where retransmissions are relatively costly or impossible. HD-PLC Alliance - Missions are to make affluent ubiquitous network society, HD-PLC Alliance is to promote high speed power line communication HD-PLC proliferation through soliciting fellow member companies.P romoting "secured" and "easy" with connected environment by the HD-PLC compliant network terminals and built-in products. HomeGrid Forum – A global, non-profit trade group promoting the International Telecommunication Union's G.hn standardization efforts for next-generation home networking. HomeGrid promotes adoption of G.hn through technical and marketing efforts, addresses certification and interoperability of G.hn-compliant products, and cooperates with complementary industry alliances. HomePlug Association - An industry trade group for power line communication. This organization of about 70 companies defines power line communication specifications. HomePlug 1.0 — (Jun 2001) — Specification for connecting devices via power lines in the home. Theoretical speed of 14 Mbit/s. In May 2008, Telecommunications Industry Association (TIA) incorporated HomePlug 1.0 powerline technology into the newly published TIA-1113 international standard. TIA-1113 defines modem operations on user-premises electrical wiring. The new standard is the world's first multi-megabit powerline communications standard approved by an ANSI accredited organization. 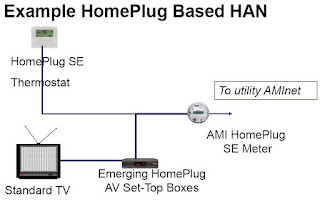 HomePlug AV — (Dec 2005) — Designed for transmitting HDTV and VoIP around the home. Theoretical PHY data rate of up to 189 Mbit/s. Differences in Forward error correction (FEC) are also one of the reasons why HomePlug 1.0 devices do not interoperate with HomePlug AV devices. The HomePlug AV specification was designed to provide sufficient bandwidth for applications such as HDTV and VoIP. The interception of data exchanged between HomePlug AV devices poses a "significant challenge" for an attacker due to the adaptive techniques used to modulate the signal between two given points. HomePlug Access BPL— (Under Development) —The alliance is developing a specification called HomePlug BPL for last-mile access networks to the home. HPCC - HomePlug Command & Control (HPCC) — (Oct 2007) — A low-speed, very low-cost technology intended to complement the alliance's higher-speed powerline communications technologies. The specification enable advanced, whole-house control of lighting, appliances, climate control, security and other devices. IEEE P1901 - An IEEE working group developing the global standard for high speed powerline communications. P1901 defines a set of multiple non-interoperable PHY and MAC specifications and a coexistence protocol between them. Although different P1901 devices may not interoperate, they will coexist with each other. HomePlug, along with other organizations such as CEPCA, UPA and HD-PLC, is participating in Development. The P1901 Draft Standard includes two different PHY layers, one based on OFDM modulation and another based on Wavelet modulation. Each PHY is optional, and implementers of the specification may, but are not required to include both. Devices that use the OFDM PHY only would not interoperate with devices based on Wavelet PHY. During its Tokyo meeting 24 July 2009, the working group approved its "IEEE 1901 Draft Standard for Broadband over Power Line Networks: Medium Access Control and Physical Layer Specifications" as an IEEE draft standard for broadband over power line networks defining medium access control and physical layer specifications. During its Boston meeting 13 October 2009, the working group decided to stop the development of the ITU-T G.hn Compatible PHY/MAC Draft option. Related chapters and annexes were removed from the Draft. In January 2010 the draft standard was published by the IEEE. IEEE P1675 is another IEEE standard related to Broadband over Power Line. P1675 provides testing and verification standards for the hardware commonly used for Broadband over Power Line (BPL) installations (primarily couplers and enclosures) and provides standard installation methods to ensure compliance with applicable codes and standards. IEEE P1775 ("Powerline Communication Equipment — Electromagnetic Compatibility Requirements — Testing and Measurement Methods") is an IEEE working group focused on PLC equipment, electromagnetic compatibility requirements, and testing and measurement methods. ITU-T G.hn Workgroup - International Telecommunication Union Objective: Create a single next gen PHY/MAC technology that runs over coax, phone lines, and power lines Flexible and scalable: can be used anywhere from low-speed home automation apps to high-speed HD video apps, while maintaining interoperability. LDPC Code - Low Density Parity Check - An error correcting code, a method of transmitting a message over a noisy transmission channel. In the last few years, the advances in low density parity check codes have developed them past turbo codes. absence of encumbering software patents has made LDPC attractive to some and LDPC codes are positioned to become a standard in the developing market for highly efficient data transmission methods. In 2008, LDPC beat Convolutional Turbo Codes as the FEC scheme for the ITU-T G.hn standard. G.hn chose LDPC over Turbo Codes because of its lower decoding complexity (especially when operating at data rates close to 1 Gbit/s) and because the proposed Turbo Codes exhibited a significant error floor at the desired range of operation. PHY (often pronounced "fye") is a common abbreviation for the physical layer of the OSI model. A PHY connects a link layer device (often called a MAC) to a physical medium such as an optical fibre or copper cable. A PHY typically includes a PCS and a PMD layer. The PCS encodes and decodes the data that is transmitted and received. The purpose of the encoding is to make it easier for the receiver to recover the signal. PoE – Power over Ethernet has created a host of new products for smart devices that have IP network capability, but require low voltage power. Applications include wireless CCTV cameras. Security access control, lighting control and control and monitoring of HVAC equipment. This application reduces the need to install low voltage wiring traditionally needed for many of these systems, reducing overall installation costs by approximately 80%. IEEE is currently defining a higher powered PoE standards which would allow for between 30 and 50 watts to be delivered to smart devices. Split Wiring - A 3-wire single-phase distribution system, commonly used in North America for single-family residential and light commercial (up to about 100 kVA) applications. In residences and small businesses with Split phase wiring (common in North America), roughly half the 120-volt outlets in the building will be on each hot phase, and HomePlug signals may or may not be able to get from one side to the other. Turbo Code - A class of high-performance error correction codes developed in 1993 where designers seek to achieve maximal information transfer over a limited-bandwidth communication link in the presence of data-corrupting noise. Turbo codes make it possible to increase data rate without increasing the power of a transmission, or they can be used to decrease the amount of power used to transmit at a certain data rate. Their main drawbacks are the relatively high decoding complexity and relatively high latency, which make them unsuitable for some applications. Turbo Code is used in HomePlug. Many devices have HomePlug built in and to connect them to a network all one has to do is to plug the device into the wall in a home with other HomePlug devices. With millions of HomePlug certified products in use, more and more people are finding that HomePlug networks are far easier to install than dedicated network cable, and also help to optimize the use of wireless networks by allowing the best placement of access points. Cost Savings - A power line system at the Venetian Hotel in Las Vegas for controlling two chillers for the air conditioning system has resulted in about $32,000 in savings a year. Easy Installation - HomePlug networks are far easier to install than the dedicated network cable needed for purely Ethernet-based networks, or for the optimum placement of wireless access points. Many devices have HomePlug built in and to connect them to a network all one has to do is to plug the device into the wall in a home with other HomePlug devices. Since surge protectors and similar devices may interfere with the high-frequency signals used by HomePlug, the directions included with HomePlug devices recommend plugging them directly into the wall outlets without using extension cords or outlet strips. High bandwidth - Enough bandwidth to support HD video applications. throughout a home. Ubiquity - Most devices have to be powered anyway. The same power cord can be used for connectivity. Power outlets are the most pervasive home wiring medium. Power outlet connectivity is available worldwide, affording the use of multiple outlets in every room at a lower cost per connection point. Broad Range of Uses - Has enough bandwidth to support HD video applications, information access and telephony services. Since HomePlug devices typically function as transparent network bridges, computers running any operating system can use them for network access. HomePlug’s Ethernet in bus topology allows co-existence of several distinct data carriers in the same wire. Security - More secure than wireless and less prone to interference from neighbor networks. Transformers Block Signal - Communication signals cannot pass through a transformers or other devices that are proliferated through out the power utility infrastruture. To get around those pieces of equipment, a bypass has to be deployed to route the signal around a transformer. Bypasses are expensive. Hidden transformers in commercial buildings inhibit Power Line communication. This is not such an issue in Europe where 50 - 150 homes may be on a single transformer, but in the architecture of US power grid there are generally only 4 - 6 homes off a local transformer. Existing HomePlug (1.0, Turbo and AV) devices will not interoperate with products based on the new G.hn standard (for power lines, phone lines and coaxial cables) developed by ITU-T. The heart of the issue is that HomePlug uses turbo coding forward error correction while G.hn is proposing low density parity check (LDPC). The two are incompatible and supporting both techniques would make HomePlug chips large and expensive. Though it is possible to build a backward-interoperable device, the complexity would be prohibitively expensive. Many old 85 Ambit/s devices are erroneously referred to be HomePlug. They are instead based on Intellon's proprietary 85 Mbit/s. Turbo mode. HomePlug 1.0 devices cannot interoperate with HomePlug AV devices without the use of a suitable bridge, although both can co-exist on the same cable. HomePlug devices will not work with other powerline technologies from Panasonic or DS2 which offer similar speeds. Split Wiring - In residences and small businesses with Split phase wiring, common in North America, roughly half the 120-volt outlets in the building will be on each hot phase, and HomePlug signals may not be able to get from one side to the other. Uneven History -. Some American consumers soured on the concept because of earlier experiments didn't work as advertised. It also never took off as a way to deliver movies to homes. Cost - Adding power-line communications capabilities into a refrigerator or a washer can cost $50. Similar capabilities with ZigBee run about $15. ZigBee offers far less bandwidth, but in houses that works fine. Here's a sample of what the conversation will be inside a smart home. Meter: "Peak power prices hit. Turn down by 25 percent." Lamp: "OK."
HomePlug, along with other organizations such as CEPCA, UPA and HD-PLC, is participating in developing the IEEE P1901 standard for powerline communications. P1901 defines a set of multiple non-interoperable PHY and MAC specifications and a coexistence protocol between them. Although different P1901 devices may not interoperate, they will coexist with each other. power line hardware is must, For the majority of overhead lines the conductor may form the most expensive single component of investment but at the same time the most exposed, dangerous and easily damaged. The overhead line and electrical power lines equipment plays a vital part in the selection of route, both pole mounted transformers and high voltage insulators are all determining factors. If an overhead power line with power line hardware is built near a coast, industrial area, desert, or at any other locales where airborne contaminants may build up on insulators, the problem of contamination induced flashovers must be considered. Working with powerlines requires specialized knowledge of transformers, power line hardware distribution systems, and substations.